For the former Democratic leader of the Ohio Senate, see Anthony O. Calabrese. 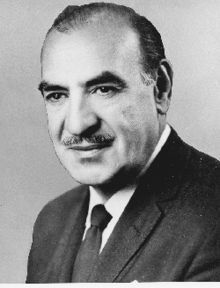 Anthony Joseph Celebrezze Sr. (born Antonio Giuseppe Cilibrizzi, Italian: [anˈtɔːnjo dʒuˈzɛppe tʃiliˈbrittsi]; September 4, 1910 – October 29, 1998) was an American politician of the Democratic Party, who served as the 49th Mayor of Cleveland, Ohio, as a cabinet member in the Kennedy and Johnson administrations, and as a United States Circuit Judge of the United States Court of Appeals for the Sixth Circuit. Celebrezze was born to Dorothy (née Marcogiuseppe) and Rocco Cilibrizzi in Anzi, a town in the region of Basilicata, Italy, one of thirteen children. The family moved to the United States when he was two years old, and the surname was Americanized to "Celebrezze" /sɛləˈbriːzi/. Having been a shepherd in Anzi, Rocco learned of work on the Wheeling and Lake Erie Railroad as a track laborer in Cleveland. Like many of his generation, Celebrezze did odd jobs as youngster, shining shoes and selling newspapers. He attended Cleveland Public Schools, graduating from Central High School and Fenn College (later renamed Cleveland State University). He graduated from John Carroll University in 1934, during which time he worked as railroad laborer and freight truck driver, as well as boxer, to pay his way. He later attended Ohio Northern University in Ada, Ohio, where he received a Bachelor of Laws in 1936 from the Claude W. Pettit College of Law (then known as the Warren G. Harding College of Law). Celebrezze began working for the Ohio Unemployment Commission in Columbus, Ohio. In 1938, he passed the bar and returned to Cleveland, where he entered the general practice of law. That same year, he married Anne M. Marco, a graduate of Western Reserve University and a teacher in the Cleveland Public School system, on May 7, 1938. With the on-set of World War II, he served in the United States Navy. Upon his discharge at the end of the war, he returned to private practice. In 1950, Celebrezze ran for a seat in the Ohio State Senate, vacated by Howard Metzenbaum, and won. He served as an Ohio state senator from 1951 to 1953. One of the few Democrats to serve in the Senate at the time, Celebrezze cultivated a friendly relationship with the Republican majority. Then-Governor Frank J. Lausche, a Democrat and former Cleveland Mayor, did not have a good relationship with the Democratic leadership in the Senate. Lausche thus relied heavily on Celebrezze to represent his interests in the Senate. In 1952, when Celebrezze sought re-election to the state senate, he ran into trouble when he crossed the Democratic party chairman, Raymond T. Miller, by supporting fellow Italian American Michael DiSalle for the United States Senate instead of James M. Carney. Celebrezze was nevertheless renominated by his party and won the general election. Ironically, he would late face off against DiSalle six years later in his bid for the statehouse. In 1952, after continuing battles with the Democratic leadership in the Senate, Celebrezze resigned to run for Mayor of Cleveland. The office was open because sitting Mayor Thomas A. Burke had decided not to seek another term. The Democratic party organization chose Cuyahoga County Engineer Albert S. Porter to succeed Burke. Celebrezze, although he did not have the support of Chairman Miller, did have the backing of Governor Lausche. Mayor Burke did not take sides between Celebrezze and Porter. In the open primary between Porter, Celebrezze, and Republican juvenile court Judge William J. McDermott, Celebrezze pulled off a decisive victory, with a substantial lead over McDermott. Porter came in third. In the general election, Celebrezze again defeated Republican McDermott. The endorsement from the Cleveland Press editor Louis B. Seltzer was always credited for Celebrezze's victory. However, some historians[by whom?] point out that Seltzer actually endorsed Celebrezze because his paper's reconnaissance found out Celebrezze was organized in all of Cleveland's 33 wards, far better than his opponents. Simply put, Seltzer endorsed the inevitable winner making it look like he crowned a new mayor. Celebrezze was elected an unprecedented five two-year terms as mayor, from 1953 to 1962. At the time, Cleveland was the fifth-largest city in the nation. Celebrezze drove efforts to build or upgrade the city's infrastructure, a massive $140 million urban-renewal program. Major portions of the rapid-transit system were constructed during this time, most notably the Red Line, which connected much of the city to the existing Blue and Green Lines. There was also extensive work done on the city's freeway system, the Port of Cleveland, and Burke Lakefront Airport. He was elected president of the American Municipal Association (now the National League of Cities) in 1958. That same year, he sought the Democratic nomination for Governor of Ohio, but lost to Michael DiSalle. In 1960, he launched the Erieview urban renewal plan, designed by architect I. M. Pei. The most prominent result of the plan was the Erieview Tower. He also spurred several building projects, most notably a federal office building(which would eventually be named after him), and the Garden Valley housing project. In 1961, after years of denying rumors that he sought a higher public office, President John Kennedy offered Celebrezze a lifetime appointment to a federal judgeship. Celebrezze turned it down to run for a record breaking fifth consecutive term as mayor, which he won by an unprecedented 73.8 percent, sweeping every one of the city's thirty-three wards. However, Kennedy appointed him to the Committee on Equal Employment Opportunity and the Commission on the Status of Women. In 1962, he also was named the president of the United States Conference of Mayors. In 1962, President Kennedy returned with an offer of a cabinet appointment. Celebrezze resigned as mayor in 1962. On July 31, 1962, Celebrezze took the oath as the United States Secretary of Health, Education, and Welfare, who is now known as the Secretary of Health and Human Services. He would continue his service in the cabinet of President Lyndon Johnson following Kennedy's death. During this time, Celebrezze contributed to the enactment of landmark social legislation, most notably the Civil Rights Act of 1964 and Social Security Act of 1965. One of Celebrezze's most important achievements as secretary of HEW was separating the public assistance and child health and welfare functions from the Social Security Administration and transferring these programs to a new Welfare Administration. Celebrezze shaped HEW to fit Johnson Administration initiatives, including getting power from Congress to deny funds for any federal HEW program to any state or institution that practiced racial segregation. However, living in Washington on a $25,000 salary apart from his family, Celebrezze asked Johnson to return to Cleveland. "We are going to lose the house in Cleveland if I continue to live here, Mr. President," Celebrezze told Johnson. The President replied that Celebrezze was too honest for Washington because he was the first cabinet secretary "to go broke while working for the White House." Celebrezze resigned as HEW Secretary on August 17, 1965. Celebrezze was nominated by President Lyndon B. Johnson on July 27, 1965, to a seat on the United States Court of Appeals for the Sixth Circuit vacated by Judge Lester Lefevre Cecil. He was confirmed by the United States Senate on August 19, 1965, and received his commission on August 19, 1965. He assumed senior status on October 1, 1980. His service terminated on October 29, 1998, due to his death. Celebrezze authored numerous opinions, including Beasley v. United States, which established a fair and progressive standard of "effective assistance of counsel" under the sixth amendment, Hill v. Tennessee Valley Authority, Gabriele v. Chrysler Corp., and Krause v. Rhodes. In the last three years of his life, Celebrezze was mostly inactive on the court, and spent most of his time organizing his personal papers. In the summer of 1998, he became easily fatigued, and advanced throat cancer was diagnosed about September. He was hospitalized briefly at Lakewood Hospital and at the Cleveland Clinic before transferring to the Corinthian Skilled Nursing Center in Cleveland about October 22, 1998. He died there on October 29, 1998. His funeral was held at the Cathedral of St. John the Evangelist in Cleveland, and he was buried at Holy Cross Cemetery in Brook Park, Ohio. Celebrezze and his wife Anne had three children: Anthony J. Celebrezze Jr., Jean Ann (Celebrezze) Porto, and Susan Marie (Celebrezze) Sullivan. Anthony Jr. became Ohio Attorney General and gubernatorial candidate. They are the only father and son to run for the Democratic gubernatorial nomination in Ohio. His brother Frank D. Celebrezze I was a Cleveland Municipal Court judge and the former Cleveland Safety Director. He is also the uncle of Ohio Chief Justice Frank Celebrezze, and Ohio Supreme Court Judge James Celebrezze, the great uncle of Ohio Appeals Court Judge Frank D. Celebrezze Jr. and Cuyahoga County Court of Common Pleas Domestic Relations Judge Leslie Ann Celebrezze, the grandfather of Anthony J. Celebrezze III (son of Anthony Jr.). In 1964, Celebrezze received the Alumni Medal from his alma mater, John Carroll University. In 1978, JCU conferred him an honorary Doctor of Laws degree. He also had honorary degrees from Fenn College, Boston College, LaSalle College, Ohio Northern University, Rhode Island College, Bowling Green State University, Wilberforce University, Miami University (Ohio) and Cleveland State University. The federal building in Cleveland is named after Celebrezze, as well as an archives room at Ohio Northern University law school (Ada, Ohio). Additionally, a Cleveland Fire Department fireboat was named after Celebrezze. ^ a b c Anthony Joseph Celebrezze at the Biographical Directory of Federal Judges, a public domain publication of the Federal Judicial Center. ^ a b "MAYORAL ADMINISTRATION OF ANTHONY J. CELEBREZZE - Encyclopedia of Cleveland History - Case Western Reserve University". Encyclopedia of Cleveland History - Case Western Reserve University. ^ a b (ASPA), Digital Communications Division (DCD), Assistant Secretary for Public Affairs (19 June 2006). "HHS Historical Highlights". ^ McCarty, James F. (October 31, 1998). "Celebrezze, Former Mayor of Cleveland, Dies at 88". The Plain Dealer. p. A1. ^ McCarty, James F. (November 3, 1998). "Full Honors for Celebrezze". The Plain Dealer. p. B1. Wikimedia Commons has media related to Anthony J. Celebrezze. Anthony Joseph Celebrezze at the Biographical Directory of Federal Judges, a public domain publication of the Federal Judicial Center. "Anthony Celebrezze". Presidential Cabinet Secretary, Cleveland Mayor. Find a Grave. March 13, 2002. Retrieved March 20, 2013.